Chilean President Sebastian Pinera will leave office with high popularity and one of the best economic records in Latin America. So when I interviewed him a few a days ago, I was curious to know what was his recipe, and why - after achieving such good macro-economic figures - did the opposition win the Dec. 15 elections by a landslide. Pinera, a center-right billionaire businessman, will leave behind a country growing at 5 percent annually, a 3 percent inflation rate and having raised the per capita income from $15,000 a year when he took office to about $20,000 today. By comparison, Argentina and Venezuela are expected to grow by less than 2 percent this year, have annual inflation rates of 28 percent and 56 percent, respectively, and their per capita income figures are below those of Chile. "Chile today is closer than ever in history to leave behind under-development, to defeat poverty, and to join the First World, which is where we want to get," Pinera told me in a wide-ranging interview. He attributed Chile's success to several factors, including "democracy, stability, the wisdom of having engaged in (political) dialogue and reached agreements, but also to pursuing a social market economy and free trade." Pinera said he is leaving office with a healthy economy, despite having had to govern "in very difficult times." When he took office in 2010, the world was in a recession, the U.S. and European economies were in deep trouble, and a devastating earthquake that left $30 billion in damages had struck Chile just 11 days before the start of his government, he noted. What about the criticism that Chile's economy is growing fast, but inequality has also grown, and poverty levels have not dropped dramatically? I asked. "We have reduced inequality and reduced poverty," he said. "Take any poverty and inequality indicator you want, whether it's those of our own universities or those of the United Nations Economic Commission for Latin America, and you will see that that poverty had remained flat during the previous government, and has dropped since. And inequality, too. That's beyond any discussion." Chile's poverty has declined steadily from 40 percent in 1990 to 14 percent today, according to U.N. figures. So if things are going so well, why did President-elect Michelle Bachelet's opposition coalition win by a landslide? I asked. "Well, democracy has its mysteries," Pinera responded with a smile. Bachelet "is a formidable candidate, has many attributes and human virtues, many of which I envy," he said. He added that "our side made many mistakes," including having had four presidential candidates during the few months before the elections. What happened to him is not too different from what happened to Bachelet at the end of her (2006-2010) presidency, Pinera said. She left office with high popularity rates, but her coalition's candidate - Eduardo Frei - lost the election. "History repeats itself," Pinera shrugged. Asked about his recent trip to Cuba, where he participated at a summit of Latin American countries and was the only president who met with the island's opposition leaders, Pinera said he is "very happy" to have met with Ladies in White leader Berta Soler during his trip. "I thought it was the fair, the right thing to do," Pinera said. "I have always thought that when one visits a country, especially a country like Cuba, where there undoubtedly are human rights and democracy problems, one has to - in addition to hearing the Cuban government - hear other voices. ... And I listened to them with all the attention that they deserved." My opinion: It shouldn't come as a surprise that Pinera is leaving office with a 49 percent approval rate. Chile's decades-old economic growth should be an example for the rest of Latin America. It shows that a democracy with robust opposition parties, free and fair elections, independent media, a market economy and a desire to join - rather than fight - the First World is much more successful in reducing poverty than Venezuelan-styled authoritarian populist regimes. Let's hope that Bachelet, who in recent times has placed greater emphasis on Chile's shortcomings than on its achievements, doesn't miss the big picture, and stays the course. 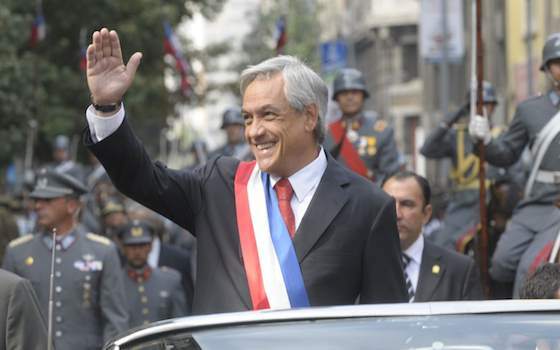 "Chile: President Pinera Leaves Office on a High Note"